On Friday we packed up all the kids and headed down to Wilmington for blueberry picking at Tammen's U-Pick Blueberry farm. 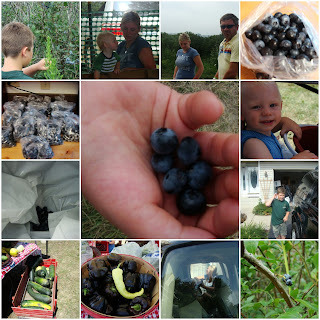 (http://members.aol.com/treeturkey/bb.htm) After 3 hours in the sun we emerged from the bushes with 14 lbs of berries! We took 12 lbs to the Plainfield Farmer's Market on Saturday and kept 2 for ourselves. I did manage to get some in the freezer for later before all the boys ate them and I am looking forward to baking with them.